I've waited much too long to get a scanner at home, but I finally took the plunge and got the NeatDesk unit for my Mac. Although I've used Fujitsu ScanSnap scanner pretty extensively in various office environments, I was intrigued by the screenshots of the Neat software and the premise behind Neat's philosophy. Further, I liked the fact that the Neat hardware is incidental to the software -- Neat was started by a bunch of software that were looking to solve a problem and they happen to also make hardware (note that Neat's software for Windows and Mac is compatible with most scanners out there, including the Fujitsu ScanSnaps). Neat's running a promo on their site right now with $100 off the retail price of the Mac NeatDesk plus free shipping. Normally I would have ordered a product like this from Amazon to get my free 2-day shipping, but the Mac version started shipping the day I ordered it last week from Neat, so it wasn't available for purchase on Amazon. Luckily enough for me, even though the free shipping was ground shipping, it still got to me within 3 days of my order, which was plenty fast. Similar to the ScanSnap scanners, the form factor of the Neat device is pleasantly small and takes up very little desk space. I followed the quick instructions to install the software first and then plug the scanner into the USB port, and my computer didn't recognize it. Quick plug and unplug of the USB cable and it fired right up -- honestly I don't think that I gave the scanner enough time to power up the first time. I ran the calibration sheet that comes with the instruction packet through the scanner and was good to go; not that I need it yet, but I like the fact that Neat includes the necessary cleaning cloth with the package instead of making it an upsell item. Once calibrated, I decided to test the scanning capabilities, so I threw in some tax forms that I had sitting on the desk. I must say that I was impressed with the speed at which the documents were scanned, even at the highest quality, and with how quickly they were available on the screen, considering the fact that all of the information had gone through the OCR process. The Neat software is, well, pretty neat. It is obvious that the software was built as a Mac application and it feels very familiar; it even supports typical Mac views, including CoverFlow. Based on the size of paper, the software attempts to automatically categorize scanned items as documents, receipts, or contact cards; this can be manually overridden as needed. There are pre-created "collections" for what you scan in, but it was very easy to create custom collections (i.e., I created a collection for 2008 tax items so that I can scan in forms and receipts). I tried a business card and the OCR software performed remarkably well, accurately capturing all of the information and sending it directly to Address Book (a connector to Google Contacts would be cool since I've abandoned Address Book). 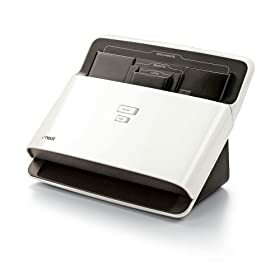 The scanner itself ships with a pretty interesting feeder attachment that is pre-sized to standard document width, standard receipt width, and standard business card width; the feeder is removable if you're doing high-volume document scanning. I put in the CD cover from the Neat software CD into the document feeder (not adjustable width-wise with the feeder in) and it managed to stay somewhat straight, but came through at a bit of an angle. Although the software did recognize that I put it in (intentionally) upside down and automatically rotated it, the rotation controls inside the software do not allow me to do incremental rotations, only 90 degree turns. Overall I would say that the NeatDesk solution for the Mac is a worthwhile investment. I primarily bought it to get rid of all the paper in my house and to get a bunch of archived paper into digital format. However, the contact management and expense reporting tools make it a worthwhile investment for business use as well. I also bought it in order to be able to make copies (i.e., scan and print) at my house and to send faxes since I don't have a home phone line or fax machine at my house. For faxing, I just hit the "PDF" button on the front of the scanner and then upload the PDF to my internet faxing service to send it; obviously you can use the same process to send documents via e-mail. Note: as I was writing this post, I got an e-mail from Neat about an additional $20 off that is good until 4/30/09, so I'll share the promo code with you: NEATDESKPREORDER. Now I need to shoot them an e-mail and get a $20 refund. Thanks, I've been planning to get a scanner as well. NeatDesk may be fine except that, unlike flatbed scanners, one cannot scan in text from a bound book. True, but that's not what I purchased the scanner to do. Thank you for writing a very useful post. Neat for Mac has been receiving a lot of bad comments as far as I know (e.g. crashing), this post served as a counterpart to those opinions.